Custom patches are the embroidered motifs which signify an organization, individual or a company. These patches are exclusive which have a considerable sense. The makers of these patches can make them in almost every color, shape or size. The companies can make these patches in every irregular shape along with features like hook/ Velcro, loop tape backing, magnetic patches, adhesive backing and iron on / heat seal patches. The other unique patches have unique features like reflective, metallic threading, will glow in the dark threading and Swarovski crystals. In the past, these patches were a luxurious symbol for the loyalties and rich but now they are used for different purposes. Patches Made For Different Purposes It would be impossible to go out on streets without seeing any patches. Security guards, Motorcycle club members, bass masters, police, soldiers, Boy Scouts and Girl Scouts all use custom patches which give a statement. Patches give different meanings and they are associated with too many things. The sports person represents it for his team, whereas the pilot signifies his wings. There are a lot of diverse reasons for various patches. They exemplify for different teams, units, organizations, departments ranks, and achievements. Some of these patches are already sewn onto garments and some are sealed by using a hot iron and are used according to the requirements of the customers. The military officers often have these patches on their uniforms symbolizing their ranks. Football, baseball, soccer teams along with biker clubs have also created patches which are of different shapes, sizes, and colors. Biker clubs also have patches which can be seen on the back of the motorcycle jackets. Custom embroidered patches give a unique symbol of trading, networking, and association. 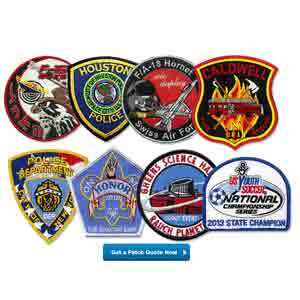 Those who want to promote their brand custom embroidered patches are another best option. Everyone can buy these patches through wholesale manufacturers. These patches can have a logo, brand’s name or any other design that reminds people to buy the brand easily. There are many online companies which create different styles of patches for different purposes. These companies produce patches on different materials of different shapes, color, and sizes. There are many whole sale companies on different search engines which can be searched online. Materials are given the top priority while selecting any patches. Some online companies use very high-quality materials which are fade resistant and the colors used do not blend either.